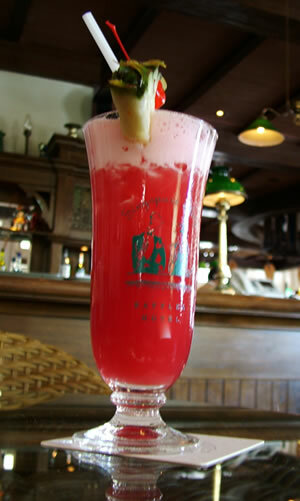 Is a Singapore Sling at Raffles a cliché? I used to consider myself a travel snob. Certainly not a tourist and even back-backing was beneath me. I went for the authentic experience; small holdall with only the bare necessities, travelling and staying with the locals, keeping off the beaten track. So when I was in Singapore recently the question of whether to go to Raffles for a Singapore Sling agonised me. My old self would have shuddered at the idea. What a tourist cliché! I’d find a smoky café in the Arab area and drink thick coffee and puff on a hookah. What is worse, I’d preach against any way but my way- if you’d been to Singapore and stayed at Raffles you hadn’t really been to Singapore. Unless you’d eaten from street stalls and slept under a fan you were just a (spit) tourist. But I’m in Singapore on business and I’m older and wiser and I hit the Long Bar in Raffles and like almost everyone else, I do the tourist thing and order the Sling. And the experience was appropriate to my circumstances. Sometimes I wonder if this snobbery rears its head in my professional world. We choose Firefox over IE, Ubuntu over Vista, agile over waterfall. Ruby on Rails is our passion, anything else is just beneath us. Commercial success is to be looked down upon; “selling out.” Bob Dylan sold out when he went electric, right! There’s a thin line between passion, pragmatism and snobbery. The thing is to know the set, setting and circumstances. Who are you working with, what’s the context and why are you there. Keep those questions in mind and the appropriate level of snobbery you may revel in should become clear. The story goes that when the building was built, the organisation taking the top floor demanded their own lift that would not stop at any other floor. They got their wish. Entrances to the lift shaft were blocked off on every floor except the ground and top floor. End of story? Not quite. The floor indicator and call buttons were installed on every floor. 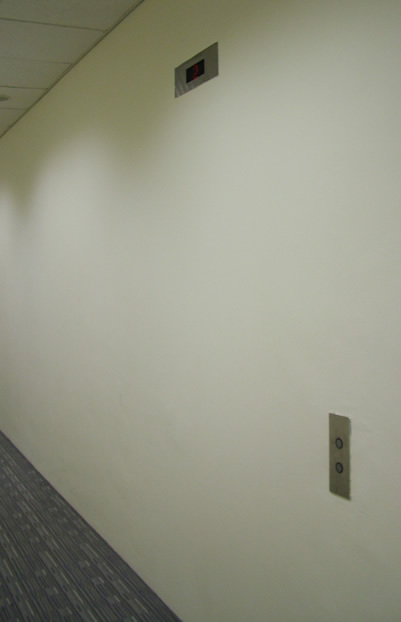 Do you build invisible lift openings when you build software? Install buttons and indicators in the anticipation that they might one day be needed. (Ignoring the fact these are mere details hiding the bigger picture… doors for example). This is a good example of YAGNI, you ain’t gonna need it. You don’t need a lift floor indicator and call button until you’ve got an opening to the shaft and doors. And when you need those lift technology will probably have moved on and the buttons and indicators will be all but obsolete. 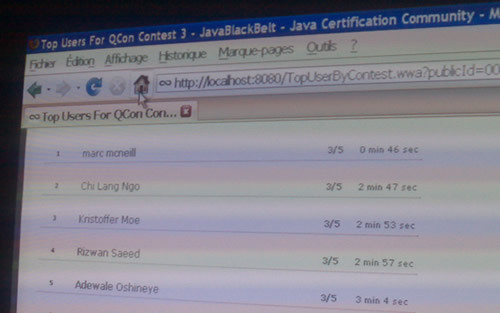 I was at QCon yesterday, ostensibly to give a presentation on usability, but I attended a few sessions as well. Not being a techie, I didn’t understand much of what Werner Vogels, the CTO of Amazon was talking about during his presentation on Availability and Consistency, but one thing has stuck in my mind. “Never, never refuse the customer from putting stuff in the shopping cart”. The context of this was around how your architectural design; do you go for consistency or availability (or something else which I can’t remember). I’ve blogged before about siloed organisations, but Werner touched on how even internal IT organisations can be siloed. Something about how your database team may be soley focussed upon consistency; they are willing to sacrifice availability for valid technical reasons. But the database needs to be seen in the bigger picture, outside the confines of the IT organisation. It needs to support the customer experience. And that means the customer must always be able to put items in the shopping cart. Period. The takeaway I suppose is to build your architecture around the customer experience; decompose the experience to do this. The technical requirements for your shopping cart will be different from your fulfilment mechanism from your “see what others are buying” from your “my details”. Make technical decisions accordingly, rather than a one-size fits all. The other day I wrote about how Surrey County Council had a “problem with their systems” and couldn’t tell us what school our daughter has a place in. We were supposed to be informed last Wednesday. They’d promised to “send the letters out” on Friday, today. Being impatient I rang them up; now the letters have been printed surely the relevent data would be available to give out on the phone to impatient parents. “It’s the EMS” I was told, “I can’t even log in to it. Today of all days”. Is this Capita’s Extended Management System? Capita, the company whose chairman gave a £1m loan to the labour party? Suddenly, (much to my shock and surprise) the Tories are becoming ever more attractive. Partciularly with the Shadow Chancellor standing up and demanding a greater use of Open Source. As a tax payer this is great news! And as employee of a great company that champions Open Source even better! I’m exercising my democratic rights next week and talking to my (Tory) MP about the farcical IT “solution” that is operating in his constituency, and will back up what his parties money man is saying. And maybe my voting intentions may be swinging. It’s education lottery time. Parents are receiving letters bearing good or bad news from schools telling them if their little lovelies have got places in their chosen schools or not. Choice being the big thing – although there isn’t really such a thing as choice, it’s more a preference. Parents have have three choices, ranked one two or three. Good schools have strict admission criteria, and will usually only accept “first choice” children. Don’t get your child into your first choice school and you are at the mercy of the local education authority – no good school will accept parents who rate their schools as second or third choices. It’s not an ideal system, but at least all the letters go out on the same day so you get to know where your child has been allocated a place. Sadly we fall into the unfortunate category of parents whose first choice has not been honoured. Our first choice school has rejected us on the grounds of distance from the school. Their classroom quota has been reached and we didn’t fill it. That is not good for us! So will we be exceptionally lucky and our daughter get a place in our second or even third preferred schools? We don’t know. And Surrey Country Council can’t tell us. We’ve got a week of anxious waiting before they send their letters out. They’ve got a problem with their “systems.” Well that is the message I get told when I rang them up. “We can’t tell you anything more because we don’t even know” I was told. Frankly it is not good enough to blame the computer. If something so critical happens in the private sector, SLAs dictate a course of action; this is a severity one problem that will be fixed within hours. Not weeks. But this is good enough in the public sector where faceless bureaucrats can hide behind the computer, cosy outsourcing deals with little accountability mean that no-one really needs to take responsibility. Take responsibility for the pain and distress this is causing me and my family! So I got their press office number from the website and rang the Head of Communications. She knew nothing of any problems with letters going out, but promised to have someone call me back to let me know what the problem was. A little while later I got a call back and was told that there was indeed a problem with the computer, specifically in resolving offers, and in particular resolving offers where children have other siblings already in the school. I was also told that they’d earlier had problems in importing data into their systems. When it tries to reinvent itself, software development takes paradigms from other industries; in many respects traditional waterfall approaches are analogous to the construction industry, and more recently software development is looking to the manufacturing industry with “lean” being in favour. The benefits of lean in the car industry are self evident, look at the daddy of lean, Toyota. Just-in-time is firmly embedded in the manufacturing lexicography and one of its by-products, six-sigma, has overtaken quality and the TQM movement in many areas. Software is still in the dark-ages of scientific management, it is more Henry Ford’s production line than Toyota’s production system. …you should be thinking about the tectonic shift from productivity to creativity – how shifting from work to play is the source of real, durable, economic gains in the post-network economy. For a start, it is generally a one-off, it is not a production line. The team who work on the film are brought together based upon their expertise, they are a project team, rather than a production line business a usual work unit. There is no architecture, rather a script (overarching story) that is visualised in storyboards. Filming is not linear, it is done in iterations; film all the scenes on a particular location, regardless of the order they fit in the film. Filming needs to be responsive to change within the boundaries of the overarching vision (business objective); often decisions are made on location; the director sees a particular shot that was not storyboarded and changes are made there and then. At the end of each iteration you have the rushes (showcase). Before being launched the film is previewed (usability tested) and depending upon the audience reaction changes may be made. An entire big Hollywood-style production cycle typically takes three years. The first year is taken up with development. The second year comprises pre-production and production and the third year comprises post-production and distribution. …and that sounds distinctly like waterfall. There is much the software industry can learn from Lean; it’s not an either/ or, rather that I’m sure there are plenty of lessons that can be learned from the film industry. Let’s not loose creativity in our drive to productivity and efficiency.